On Friday morning, GroupValet announced the launch of their integration with Amazon’s Alexa voice services. 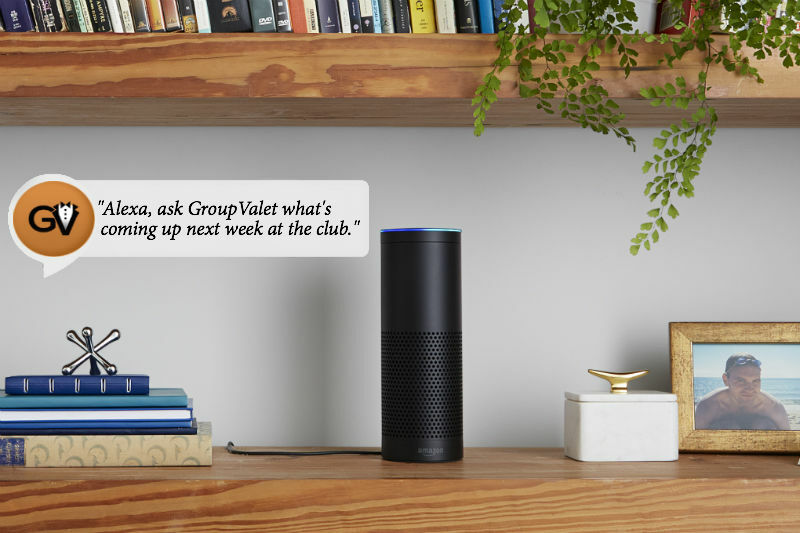 This integration allows members of GroupValet Clubs and Associations to find out about upcoming activities and events just by asking the Alexa device in their home, such as an Amazon Echo or Dot. “Until now, members have had to proactively search out upcoming activities and events by logging into the club’s website, logging into an app, calling the club, or scouring the club calendar. Now members can seamlessly interact with their club from the comfort of their home. ", says Jeff Tomberg, founder of GroupValet. The version of this “Alexa Skill" that is now available for free in the Amazon Skill Store (https://grpvlt.co/alexa) will tell members what they are signed up for, or what’s available for them to sign up for. Members can ask about specific types of activities, such as golf, tennis, cards or dining, or ask about all available activities. Alexa will tell them what’s coming up, including club-wide events, and even activities that are run by other members. The next phase of this integration will allow members to sign up for club events through Alexa and even let the club send important messages and alerts that Alexa will read to the members. “I suspect once clubs see how powerful this approach can be, they will quickly embrace it. After all, clubs are all about providing personalized experiences and you can’t get more personalized than this", says Tomberg. GroupValet is offering free white-labeling to their member clubs and organizations. Instead of enabling the “GroupValet" skill, members will enable the skill named after their club. It’s yet one more innovative way GroupValet is bringing member engagement to the members. To learn more about Amazon devices with Alexa built in, visit https://www.youtube.com/watch?v=FQn6aFQwBQU. To get the GroupValet skill for Alexa, visit https://grpvlt.co/alexa. GroupValet is the industry leader in member engagement for clubs and organizations. By bringing the activities to the members and removing all the barriers to signing up, GroupValet Clubs see more signups for their events. And equally important, the signups happen earlier, providing the club with more time to be proactive about any changes that are needed for the event. To learn more about GroupValet, contact info@groupvalet.com or visit www.groupvalet.com.